Are you expecting or have more then one breastfeeding child? 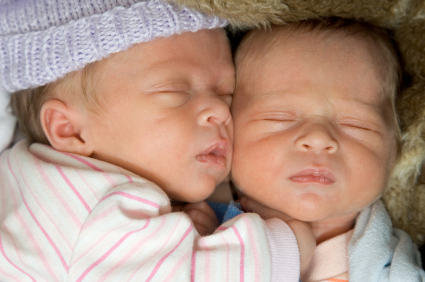 Having multiple births can be a blessing but, at the same time, can pose several problems. One of which is breastfeeding. Before you hit the panic button, here are some helpful breastfeeding tips for moms of multiples. Most experts, including other moms of multiples, suggest buying a really good nursing pump. It not only stimulates milk production, but allows you to collect as much milk as you need to feed the babies. There are electric double pumps which allow you to express milk from both breasts at the same time. Although this can be costly to purchase, you may want to think about renting this kind of pump from a medical supply company. In addition, seek and accept whatever assistance is offered by either family members or friends. This is a time when everyone needs to come together and address the concerns on a day to day basis. If you’ve had twins, try [tag-cat]breastfeeding[/tag-cat] both at the same time. It is really whatever you feel comfortable with. There are no rules defining the right or wrong way to handle this situation. While nursing one [tag-ice]baby[/tag-ice], use the pump on the other breast in order to increase milk production. Above all, when breastfeeding your baby, choose a quiet area in your home where you are most comfortable. Ensure there are no disturbances. Make certain you get plenty of rest in between feedings; reduce your stress level by engaging in a proper diet, and be sure to drink plenty of fluids. According to experts, [tag-tec]newborns[/tag-tec] breastfeed from eight to fourteen times a day within a 24 hours period. In addition, they suggest simulating a newborn’s feed routine in order to produce more milk. While each pumping session may take 10-20 minutes, the length of time will vary with each woman. Continue to pump as long as you have a good flow. As long as you are surrounded by those willing to assist you with your multiples, there is nothing to worry about except you and the babies. Trying not to do everything yourself; will only complicate the process. Take it slow and easy, and everything will be fine.